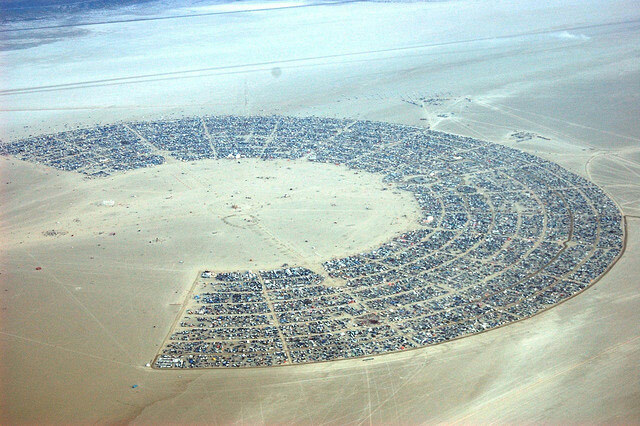 An interesting article making some strange connections between the land of free spiritedness that is Burning Man, specifically the arrangement of the temporary settlement 'Black Rock City' with the ideology of New Urbanism. I can't think of two uniquely different mind-sets and approaches, so find the connection to be somewhat comical - but am keeping an open mind. So read for yourself... and determine perhaps if that next vacant town square surrounded by walk-up townhouses would benefit from an iconic super human sculptural icon that regularly is set aflame? Maybe it would be a Waldheim effigy? Who knows. "One of the many ways in which Black Rock City epitomizes thoughtful city planning, Mr. Garrett said in a 2010 interview, is that people are responsible for managing their own waste. (“Leave no trace” is a Burning Man mantra.) Another is that cars are sidelined, thanks to a layout that makes walking and biking far less onerous than driving. In that approach Mr. Garrett had allies among the New Urbanists, the town planners sometimes labeled reactionary for promoting quaint enclaves like Seaside, Fla. He also had a soul mate in Janette Sadik-Khan, New York City’s transportation commissioner, who is responsible for closing some streets to vehicular traffic"
I was interested in hearing that Rod Garrett, who was asked to lay out the plan - and his experience as a landscape designer... creating something both flexible yet keeping a tight footprint with an awareness to the overall ideas of circulation. 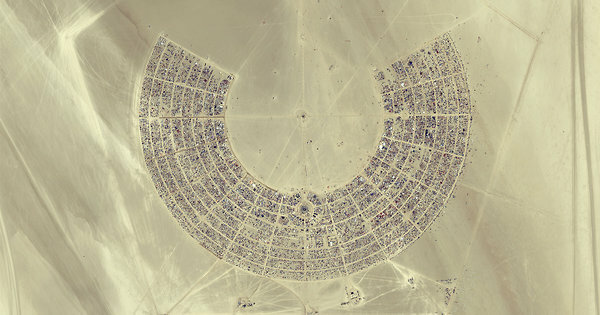 A quote from a obit on Garrett, who recently passed away, comes from Yves Béhar, "...design professor at California College of the Arts and a 5-year veteran of the Playa himself, described Mr. Garrett as "a genius", explaining, "A circular temporary city plan built around the spectacle of art, music and dance: I wish all cities had such a spirit of utopia by being built around human interaction, community and participation." All this does really make me want to go to Burning Man... maybe a travel fellowship. Read here: "A Vision of How People Should Live, From Desert Revelers to Urbanites"